Sometimes, words fail to convey our deepest emotions and thoughts. Music wins where words fail, they say. It is even called the language of the soul, one that everyone can understand. And why not? Music transcends borders, cultures, and societies. It knows no race, religion or community. All it knows and spreads is love. And so, in trying to find love in music, we are united, we are one. In an interview with Soulveda, Bellur talks about her journey as a singer, how spirituality has shaped her as an individual, and how music unites people with love. Your first public performance was at the age of 14. How has the artiste in you grown since then? Being on the stage, performing, was always motivating for me. When people begin appreciating art, an artiste feels like giving more. I guess, I had an artiste in me right from the start. My father introduced me to Hindustani classical music and advised me that it was a long journey. “You can expect rich dividends, if you give it patience and perseverance,” he told me. And classical music usually gets better with age, as the artiste masters technique, aesthetics, and adds soul to it. There is always something that inspires an artiste. Where does your inspiration come from? As a child, the image of Mirabai with her ektara (one-string music instrument) was stuck in my mind. Later, it was the legendary classical vocalist Kishori Amonkar. The image of a singer was slowly setting in my mind. From Mirabai to Kishori to my own image, visualisation was on. I had no clue that it was a good practice, yet I was inadvertently following it. Although, it is not just visualisation. Love inspires me. Ragas inspire me. Nature, beauty, and music of the maestros inspire me. You are a trained Hindustani Khayal singer. How has this genre of music contributed to your spiritual journey? As a Hindustani Khayal singer, one learns notes, ragas (melodic structures with specific attributes) and then progresses to badhat–the elaboration of the raga, note-by-note, embellishing each one according to the grammar of the raga. The beauty of the raga unfolds layer by layer. Through aakaar aalap, swift taan, one is able to ‘see’ the raga as an individual with a personality. This transition from abstract to form (imaginable by the human mind), is like a spiritual journey towards that formless infinite we call God. Sufism is about love of divine and fellow beings. How has this philosophy shaped you as an individual? For me, Sufism is the experience of total absorption with the divine, whom one loves like a beloved. The saalik (seeker) starts to see divine light in every creation. Being at peace with fellow creatures becomes a default action. Any service or action is usually guided by an intention. A Sufi’s intention is just to get lost in the thought of the beloved, please him–all for love’s sake–not with an eye on reward or punishment. I don’t know how it has shaped me. But I will be happy to evolve to a higher state from wherever I am in the pursuit. Listening to Sufi music is an ecstatic experience. How does it feel to be able to create such an experience for others as a musician? If one can create an ecstatic experience for the listener, it is a great achievement. If my music touches the Object of my love to whom these notes and words are directed, then I can consider myself dhanya (fortunate). I notice some listeners relate to my expression of love, but I can’t really say if I am successful. It is up to the listener to say. Your rendition of Kab Tak Mere Maula is really moving. Could you share your experience of rendering this Qawwali? It is an all-time favourite. People send in requests for it in every mehfil (assembly) as it is a moving kalam (discourse). Poet Shaz Tamkanat has articulated one’s plight so well. The poetry moves me, the composition moves me. It feels like the poet has articulated my plea to the creator and given wings to my words. But until when should this go on, my Lord? But until when should I go on like this, my Lord? Music expresses that which cannot remain silent. In a society, where intolerance is rife, how does music unite people? Today, the intolerance one sees is largely by a set of people who simply love to hate! I am amazed how one can go about living life with so much negativity blocking their pores that should have been allowing the oxygen of inspiration, ideas/creativity to seep in like a breath of fresh air. There is still hope, as a large mass of people don’t know that our holy scriptures overlap in so many areas. I have personally seen so much in common between the Quran, Gita, Upanishads and the Bible. What do you intend to convey through your music? Love. Love for the notes, ragas and traditional music (classical, Sufi, folk etc.). It is also love for mankind, nature, and for all that is outside us as well as within (peace). Love of the self, love of submission to the Divine. 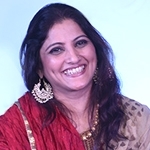 Smita Bellur is India's first female Hindustani vocalist to have been accepted into a lineage of traditional qawaals (Sufi/Islamic mystic singers) and to have received extensive guidance from them. She has dedicated her life to raising her daughter, performing and teaching music.